Polygon is a closed plane figure bounded by straight lines. There are two basic types of polygons, a convex and a concave polygon. 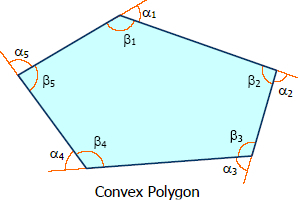 Polygon is said to be convex if no side when extended will pass inside the polygon, otherwise it is concave. The sum of the angles of polygon of n sides is 180°(n - 2) right angles. The exterior angles of a polygon are together equal to 4 right angles.